The revenue from funds, investments, financial ventures, and commerical activities such as stores and royalties constitute a business activity. The top 10, generally large and well-endowed, obtain an average of 84% of their income from Business sources, $17 million annually on average. 6 of the 10 are on the East Coast; 4 Central; 0 on new money West. In the 2007 fiscal year, by far the largest component is gains from sale of securities, with 3 obtaining more than $10 million, but this source can be volitile. The bottom 10 only obtain an average of 1% from Business sources, obtaining 86% from Donations, and the remaining 13% from Program Services. 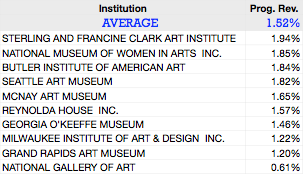 The overall average for 304 institutions is 21%. 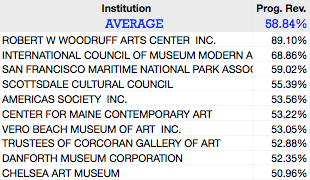 The top 10 art museums average 59% of total revenue from Program Services. The level of income ranges from $301 thousand to $17 million indicating that size is not a prime determinant of the ability to earn PS revenue. At least as important as the level of PC revenue, the Top 10’s revenue covers 80% of Program Expense. 8 of the 10 are East Coast, 2 West. Even though the income is disbursed over a wide audience, overall economic factors can affect revenue. The bottom 10 obtain only 2% of their revenue from Program Services, averaging $673 thousand. Worse, that revenue covers only 8% of Program Expense. The overall average for 303 institutions, large and small, is 15.2 % This means that the dominant force concerning the institution’s survivability lies outside the organization, mostly with Donors. Cultural, Arts, and Natural Science institutions discussions typically revolve around aesthetics or grand principles. They can be heated for lack of objective measures. Sound management, however, requires metrics. You manage what you measure, said Prof. Louis Lowenstein, Columbia University. 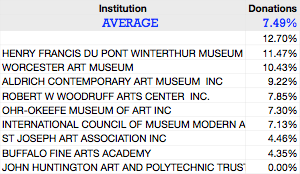 These Art institutions rely very heavily on current donations, averaging $2.5 million. In spite of, or perhaps because of this, they spend only an average of 3% of the amount raised on fund raising. The high level indicates a loyal donor group, but such strong dependence on a single source leaves them fat but vulnurable. The bottom 10 obtain only 7% of their revenue from donations, ranging from nothing to 13%, with an average of $1.5 million. These institutions are not hard up, however--they earn 70% of their revenue from Business operations. See their appearence below. 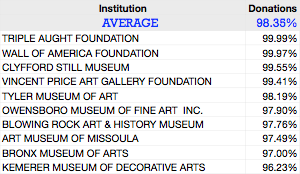 The overall average Donation percentage for 301 institutions is 64%.